Instant Clear Jel is an amazing food product that thickens foods instantly without heat. It will not only save you time and money, but can also save you inches on your waistline. How? 1. It reduces sugar in jams and syrups and fat calories in desserts, salads, dressings, sauces, dips, and breads. 2. It saves time in food preparation and money by eliminating products no longer needed. 5. It can be used with any sugar substitute which is a great benefit for diabetics or the weight conscious. For years, Instant Clear Jel and its many advantages has been a secret only known by large companies, and used in their food products. Instant Delite is the first cookbook published that explains the many advantages and uses of Instant Clear Jel, so they can be enjoyed by everyone. Instant Delite contains several recipes from entrees to desserts that are perfect for the whole family. And because it stores indefinitely, and doesn't need heat to thicken, it is also a perfect addition to your food storage. Take advantage of the many benefits of Instant Clear Jel, and learn the cooking secrets that used to be known only by big companies. You will love the new cooking experience Instant Clear Jel brings to your kitchen. 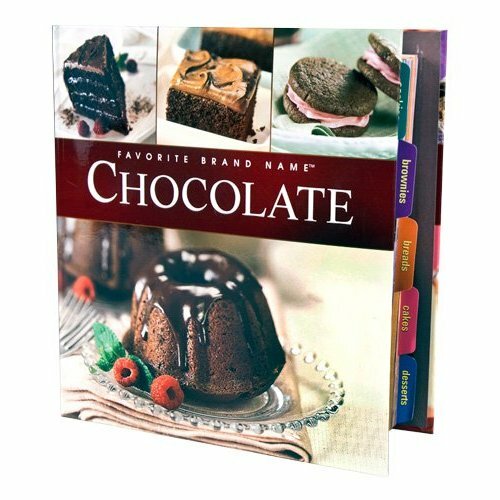 Join the delicious celebration of chocolate with the Favorite Brand Name Recipes Chocolate Cookbook. This comprehensive five-ring binder cookbook contains more than 150 irresistible recipes that will delight chocoholics of all ages. Discover recipes for classic cookies and bars, incredible cakes and decadent desserts, and chocolate-filled breakfast treats such as muffins, breads and pancakes. Whatever your chocolate craving might be, you'll satisfy it right here-this cookbook is a chocolate lover's dream come true. ©2015 Copper Cauldron Candy Company, Inc. All rights reserved.